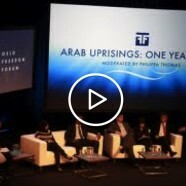 One year after his presentation on Morocco’s “Subtle dictatorship”, the blog’s author comes back to the Oslo Freedom Forum to participate in a panel titled ” The Arab Uprisings: One year later”. This is an hour-long (yet fascinating) discussion on where the Arab Spring is at, and is heading to. Held in Oslo on May 8th, 2012, the debate features talented bloggers and activists Lina Ben Mhenni (Tunisia), Maryam Al Khawaja (Bahrain), Ghazi Gheblawi (Libya) and Amir Ahmad (Sudan), and is animated by the BBC’s Philippa Thomas. Rights Rights Rights…Indeed, everyone wants Rights without understanding the laws of the country. In order for the laws to apply, corruption is the enemy. It takes time to conquer it, a real example is Indonesia: 30 years mission to clean up the mess for the country to be as successful as it is today. My opinion is, voice yourself and wait for a change. Voice again and wait some more and wish/pray/hope that the upcoming generations will see the changes.